Simply imagine your Mediterranean yacht charter… Imagine waking up every morning in a different location with stunning views over the Mediterranean, your charter yacht anchored off a beautiful cove. You come out on deck, no other people in sight but friends and family, you are served a delicious breakfast prepared by your very own Chef. Meanwhile, your crew prepares the navigation and activities of the day: water sports and inhabited island exploration. While luxury hotels can be tremendously exciting, charter yachts are just much better in many ways. A Mediterranean yacht charter holiday offers the ultimate combination of luxury, flexibility and service. 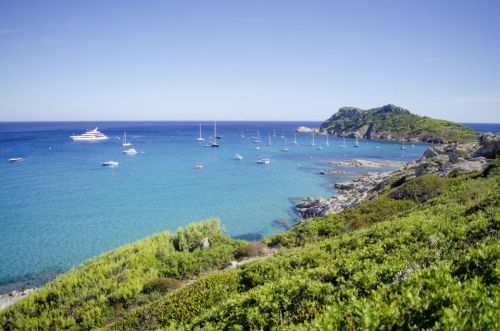 Here are 5 good reasons to consider chartering a yacht in the Mediterranean for your next holiday. Privacy is probably one of the best aspects of a yacht charter vacation. 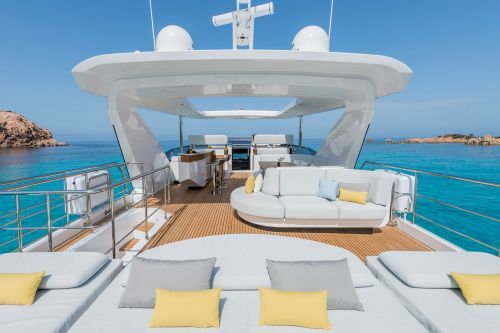 No need to fight for a sunchair, to wait for a cocktail, to share a jacuzzi, to bump into strangers… On a charter yacht, you’ll have the whole thing to yourself and your guests whether it be family or friends. A yacht offers plenty of space for you and your guests to spread out, relax or entertain. With the fantastic amenities of a charter yacht, no doubt everyone will be entertained! 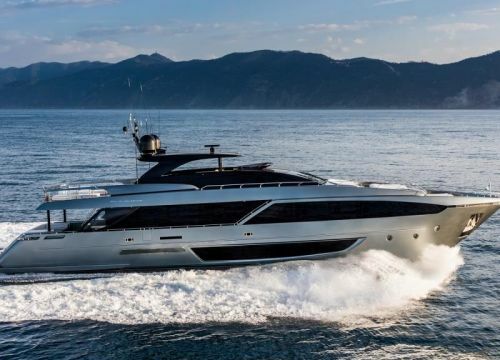 A Mediterranean yacht charter offers maximum flexibility. 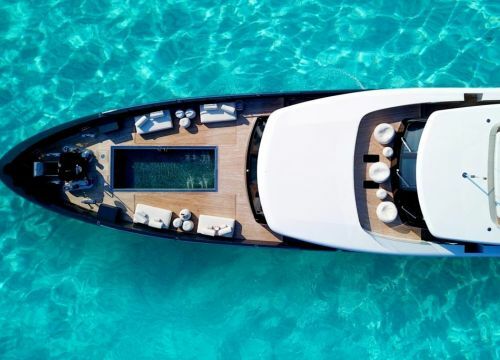 Whether you prefer to sunbathe on the sundeck, jump in the sea for a swim, snorkel, play with water toys, explore the surroundings, anchor in a cove or step ashore, a yacht charter allows you to steer your own course. Exploring remote coves, discovering the Mediterranean hotpots or a bit of both, you decide! Choosing a yacht charter for your holiday gives you the opportunity to make the most of each moment. You’re loving this snorkelling spot? No rush, the Captain won’t weigh anchor without you. Any activity can be postponed. It’s your vacation, your yacht, your program. 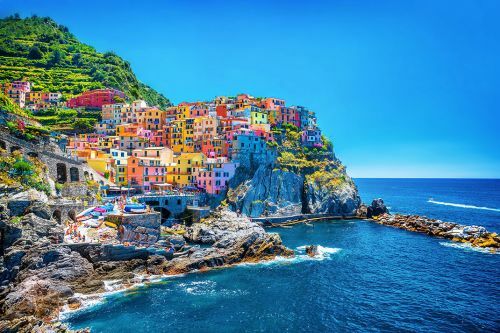 Your Mediterranean yacht charter will enable you to experience multiple locations without the hassle of packing and unpacking each time you relocate. It will also give you the opportunity to visit some untouched paradises that are only reachable by boat. All you have to do is lie back and relax while your Captain takes you to the next anchorage. If you don’t want to sail during the day, you could ask your Captain to make an overnight cruise so you wake up in a different location. If hotel staff are extremely well-trained, you’re just one client among hundreds. During your yacht charter holiday, you’ll enjoy the professional service of a dedicated crew who will always be on hand to assist. The service of a private Chef is particularly great. The yacht Chef is briefed about your food preferences prior to your embarkation and will then prepare delicious meals during your entire Mediterranean yachting holiday. Just relax, enjoy the company of your guests and rely on the local expertise of your Captain and charter planner. From the choice of the perfect anchorage to the restaurant recommendation, they will work together to make your charter experience as memorable as it can be. Ready to experience a memorable Mediterranean yacht holiday? Browse our selection of charters yachts and our cruising destination guides to get inspiration for your next yachting holiday in the Mediterranean.